Guests are always welcome to attend meetings, but we encourage regular attendees to become members by paying dues. Queso Diego dues are $20 per year for individuals or $30 per household. These dues help us pay for meeting supplies and commercial examples, as well as supplies for pairings and other club expenses. In addition to the benefits at meetings, we have negotiated discounts for members at local businesses. We also have some special members-only events each year that you don’t want to miss. The officers are always working to secure additional member discounts. If you have suggestions for businesses to contact or represent a business that would like to offer a discount, please contact the officers. Dues can be paid by cash or check at meetings, by mail, or through PayPal. Instructions for these payment methods are below. You may bring payment in cash or check to any Queso Diego meeting or event. Please see our membership chair, Olaf Walter, to make payment and get your membership card. Checks may be made out to Chuck West. Checks may be made out to Chuck West and mailed to our treasurer, Check West. Please contact treasurer@quesodiego.org for the mailing address. 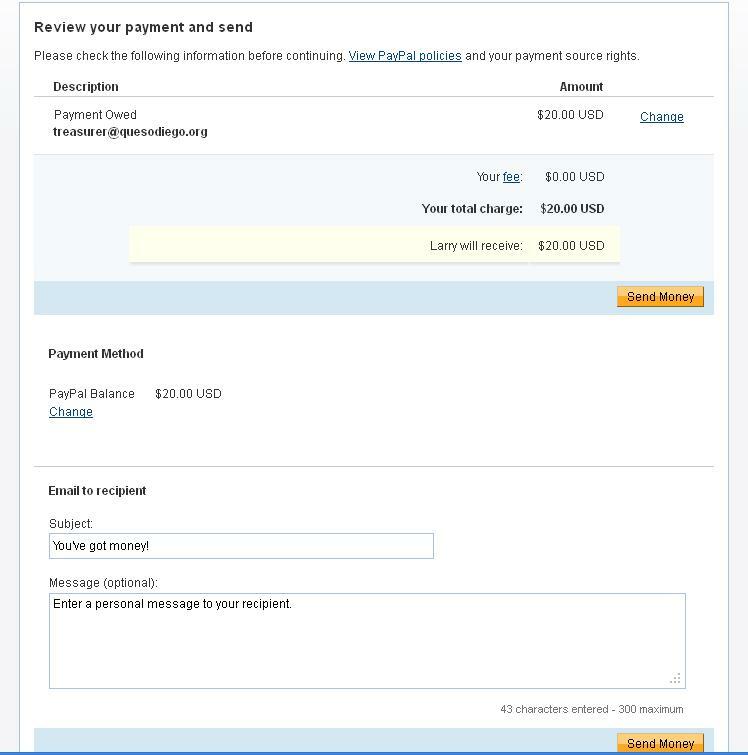 You can now pay your Queso Diego dues by PayPal to payments@quesodiego.org. If you choose to pay online, please include an extra $1 to cover the paypal transaction fee we are charged. See the instructions and screenshots below. 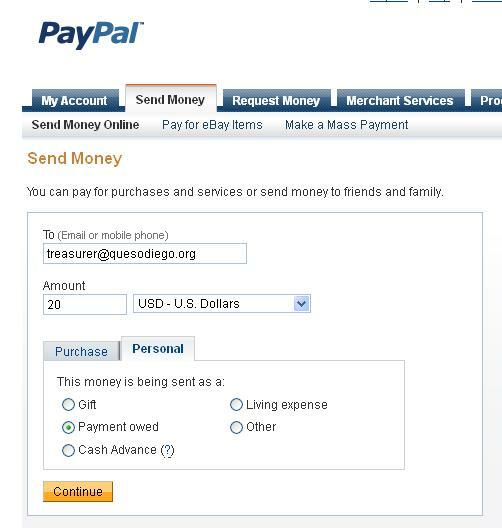 Log in to your paypal account at paypal.com. If you don’t have an account, you will need to create one. Amount: $21 for personal membership $31 for household. Select your payment method (paypal balance, bank account, credit card). Click on Send Money to complete the transaction.